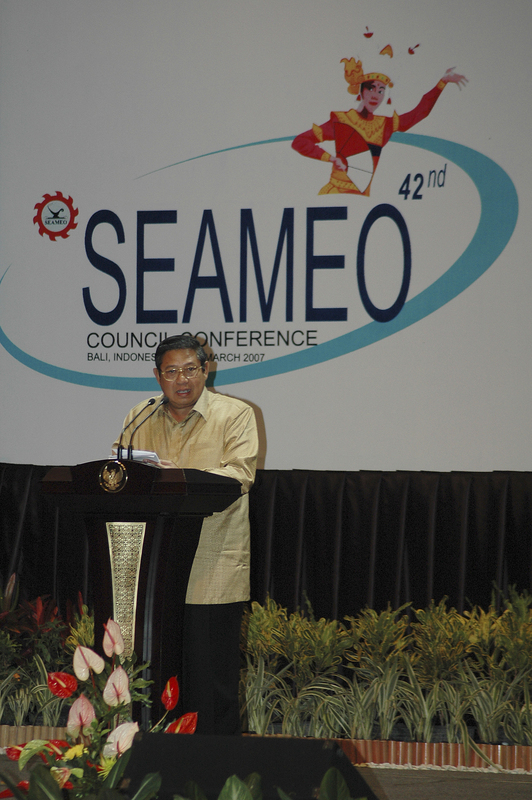 The 42nd SEAMEC was held from 13-15 March 2007 at the Westin Hotel Nusa Dua, with Indonesian President Susilo Bambang Yudhoyono opening the conference with a keynote speech noting SEAMEO’s key role in supporting closer regional integration. The ministers proceeded to the Royal Pita Maha in Ubud on 16 March for the 2nd ASED, a conference jointly organized by the SEAMEO and ASEAN. 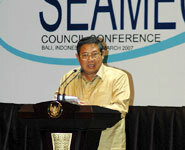 Indonesian President Susilo Bambang Yudhoyono opens the 42nd SEAMEO Council Conference with a speech highlighting SEAMEO's key role in regional integration. Southeast Asian education ministers pose with heads of delegations and the Indonesian president at the opening ceremonies of the 42nd SEAMEO Council Conference.